This article has been sponsored by JD Sports, but I always stand by the fact that I only accept sponsorships from brands I trust and love so it’s nice to have JD Sports returning to Manface once again. Like me, you surely must see so many people as you pass down the streets and think to yourself that he/she could be a model? … Just me? OK, but still, thanks to JD Sports, my speculations could actually become a reality. JD Sports are on the hunt for a new face of the brand for 2014 which will not only see the winner as the featured model across the hugely circulated JD Sports campaigns but will also lead to the possibility of modelling work with other great brands. Hear previous winners talk about their success with the campaign and competition in the video below. The last Face of JD campaign search saw a 50% increase in entrants and a weekend long international Twitter Trending Topic! This is a big deal guys! So this year’s event is going to be even bigger! With Glasgow, Birmingham and Liverpool being added to the London and Manchester events, JD has extended their search for models to appear in advertising campaigns that will see winners feature on posters, billboards, bus sides and in magazines. What I love about this campaign is that you don’t have to be 7 feet tall with a 26 inch waist or be an emaciated size 0 – this is not a supermodel search – it’s about real people who look and feel great that would fit in with the high-speed, high-energy ethic of the JD Sports brand. The JD Buzz Teams will be hitting the road next week with ‘Face of JD’ talent scouts and film crews – meaning they could be visiting a college, shopping centre or high street near you! For details on which areas they’ll be in each day check out JD’s official Facebook & Twitter pages. 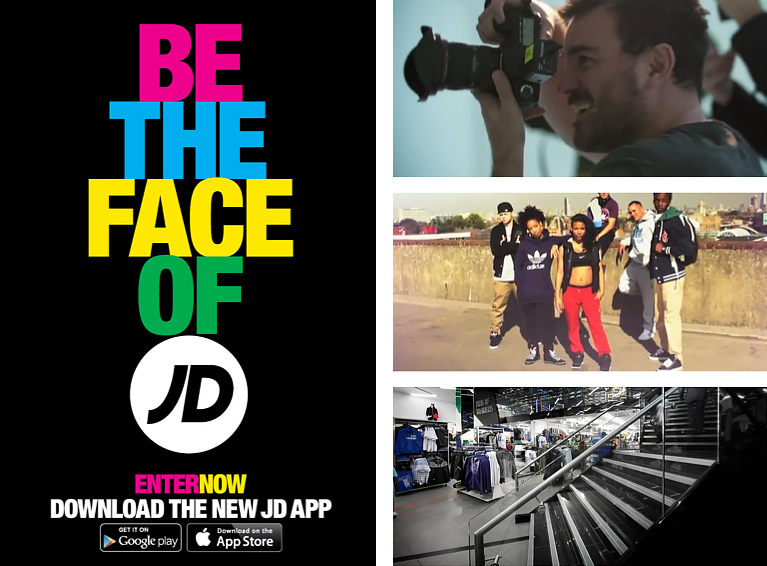 Entering is easy-peasy, by either simply downloading the JD app from the Google/Apple app stores; visiting faceofjd.com or facebook.com/JDSportsOfficial and upload a recent photo of yourself with an explanation of what you’re into and what you’re most passionate about. Once you have applied, get all of your friends and family to vote for you online. The top 20 most-voted-for entries per region will automatically go through to one of the castings. The people invited to the exclusive JD castings will have their photos taken by professional photographers and be filmed by the JD TV crew. Everybody invited to a casting will also receive a JD goody bag packed full of freebies! Once the castings are over, the judges will select winners from each day, who will then be used in official JD photo shoots where a leading fashion photographer will photograph them wearing the latest JD gear. The best images from that shoot will then appear nationwide in JD’s next advertising campaign! So what are you waiting for..? This article first appeared on MANFACE written by Thom Watson. It was published on Thursday 23rd January 2014 and was last updated on Monday 3rd April 2017 at 3:08pm. It's categorised under JD Sports where you'll find more related content.